Hi from Sydney! I’ve been here for a week and have ridden approximately 12 ferry rides, taken about 50 million pics of Circular Quay and the Opera House, and seen the most perfect rainbows. I’ve also obviously been exploring the food again and please send help to my arteries. I’ve been hitting a mix of new to me spots and some places I enjoyed last time I was here. I skipped Pocket Pizza this time, mostly because I don’t want to eat dinner that completely alone, but also because I don’t need to since I’m accidentally already od’d on pizza. I had a decent spicy salami pepper one my first night here, and then the next night went to my fave restaurant to watch the sunset in Manly. I got the prawn pizza, which was disappointing, but only because I wanted giant, dramatic prawns and they were just the regular non-diva version (kinda like the sunset, womp womp). If you’re keeping track that was 2 pizzas in 2 days and 1 me and so no more pizza this week. Buuuuuut, we just celebrated the Winter Solstice down here so how about some warm, cozy pizza?? I really am cruel to myself, aren’t I? After a week of stuffing myself with all the fun food I can find the thought of anything other than a salad right now makes me want to barf, so I give you this creation with less joy and more of an “it’s really good just keep it over there” feeling. But it was really good! Don’t let me and my pizza-flooded veins dissuade you. I guess it’s good then that I made this one so long ago I was basically another me, or at least a younger me, one who was still 30 and didn’t think about why she maybe shouldn’t eat so much pizza. But maybe also it’s good I’m cheating and not calling this pizza. It’s flatbread, ok? Based on my extensive menu research that just means it’s pizza in a longer shape, but we can pretend. This particular oblong FLATBREAD has spicy coppa, herby ricotta, and some lovely, bitter broccoli rabe to nudge everything over to the virtuous side of the line (how far past that line you find yourself is really between you and your coppa god though). I know i’m talking about winter here, but hey, this would be excellent, dare I say even better, assembled outside and finished on a grill with some chilled wine and a summer evening. Just give me a few weeks before you tell me you ate it, ok? Heat oven to hottest temperature, preheat a pizza stone or steel. Shape dough into a long rectangle shape and flatten. Mix together ricotta and any combo of desired herbs to taste. Spread over the dough, leaving a 1/2-inch border. 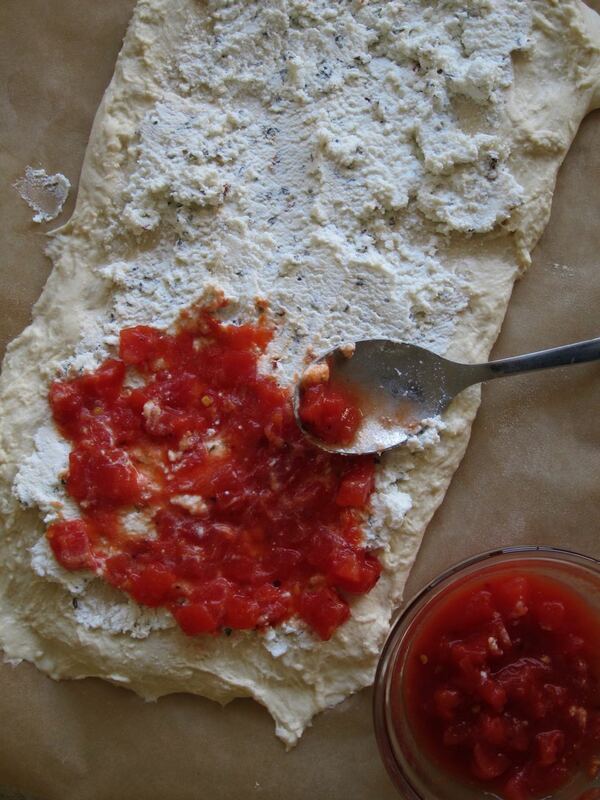 Mix together tomatoes, salt, and chili flakes and spoon and spread over the ricotta. Top with broccoli rabe and coppa. 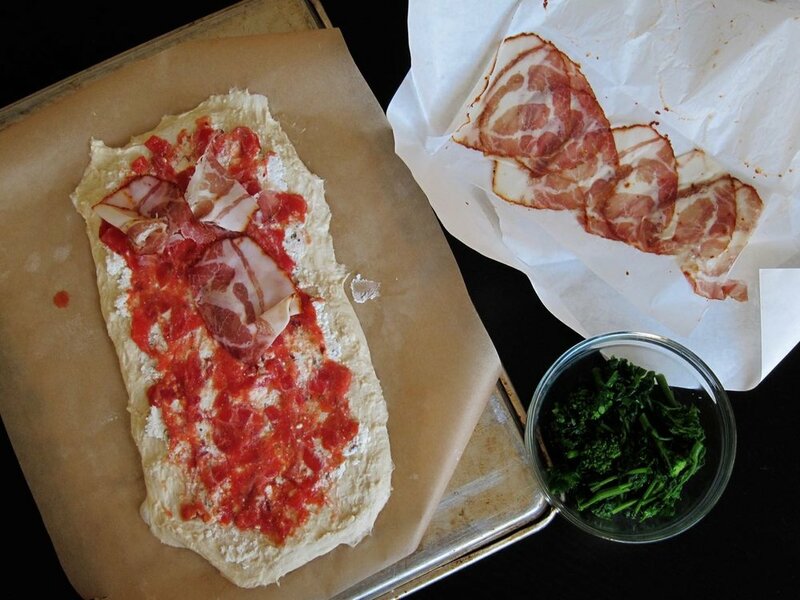 Slide pizza onto hot pizza stone or steel and bake, 15-20 minutes. Finish with some fresh lemon zest and juice. Serve hot.